-Who Makes It, and How Is It Made? In 2010 Chinese foreign policy seized the initiative in East Asian relations. As the United States made plans for withdrawal from Iraq in 2011 and proceeded with a build-up to be followed soon by a drawdown in Afghanistan, the two wars that had come to define the global arena in the 2000s lost their allure in the international spotlight. President Barack Obama made it clear that the U.S. priority would be East Asia, broadly construed. In 2011 at the Honolulu APEC summit and the Bali East Asian Summit he reaffirmed this “pivot.” His initiatives were met with suspicion in China. After all, in 2010 its less conciliatory policies had aroused anxiety throughout the region. Other countries, including the United States, were reacting to its aggressive moves and its refusal to condemn those of North Korea. With China’s leadership poised for renewal in 2012-13, observers were paying close attention to what this might mean for the stability of the region. 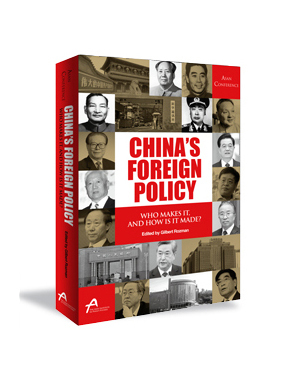 It was becoming increasingly urgent to understand who makes Chinese foreign policy and how it is made, looking back and also looking forward. The lessons drawn about 2010-11 gained added poignancy in December 2011 with the death of Kim Jong-il, which aroused uncertainty about North Korea’s political stability and about China’s responses. In their acceptance of Kim Jong-un as the successor to what China identified as a “socialist” regime, Chinese leaders were reinforcing the closer ties they had recently been cultivating with the North’s leadership. The transformation of Sino-North Korean relations is one step in China’s vigorous foreign policy, which observers have been monitoring closely in the aftermath of 2010 developments. The May 19-20, 2011 Asan conference provided a venue to reassess foreign policy decision-making in China. Bringing together leading voices in this reassessment, the meeting elicited lively exchanges centered not on refuting rival interpretations but on jointly exploring leads that clarify the processes of China’s foreign policy formulation that have yet to be adequately explained. The discussion, as the chapters in this book, proceeded from the general to the more specific level. It prioritized the joint search for answers to questions, not differences based on the nationality of the respondent, although there were occasions when some of the Chinese participants were presumed to have knowledge of aspects of recent developments that others at the conference were seeking to understand better. Updating the conference papers to cover the end of 2011, this book reflects the state of analysis on the eve of the important 2012-13 transition to China’s fifth-generation leaders. 이 책은 지난 2011년 5월에 아산정책연구원이 개최한 <중국 컨퍼런스>에서 발표한 논문들을 묶어 새롭게 정리한 것이다. 김정은 체제의 출범 등 북한 권력의 변화와 함께, 북한에 대한 견고한 지지를 계속하고 있는 중국의 태도는 앞으로의 남북한 관계, 또는 동아시아 전체에 커다란 영향력을 미칠 것이 확실하다. 이런 시점에서, 중국의 외교정책을 만들어내는 세력, 또는 싱크탱크들에 대한 연구는 꼭 필요할 뿐더러 매우 중요한 의미를 가진다고 할 수 있다. 총 12개로 구성된 이 책의 내용을 장별로 간단하게 살펴 본다. 이 책은 모두 5부로 구성됐다. 제1부는 중국 외교정책과 조만간 권력을 잡을 것으로 예상되는 제5세대 지도자 아래에서는 정책이 어떻게 변화될 것인지를 주목했다. 외교정책에 대한 도전과 새로운 지도자 아래에서 변화의 가능성도 다뤘다. 제 1부를 훑어보면 중국에서 정책을 결집하고 이를 통일하는 데 갈수록 어려움이 늘고 있음을 파악할 수 있을 것이다. 제2부는 중국 싱크탱크들을 다룬 두 개의 장으로 구성됐는데 이들 기구들이 어떤 수준에서 영향력을 발휘하며 내부와 외부 서클에서 어떻게 서로 다른 평가를 받는지를 파악했다. 이 싱크탱크들은 여러 논의들을 지속적으로 확실히 통제하면서 외교 정책을 더욱 효율적으로 운용하도록 하는 등 최고위 의사결정자들에게 큰 영향력을 미치고 있다. 2010년 중국 정책이 소프트 파워 쪽으로 옮아가면서 이와 관련한 수많은 유력 학자의 견해와 싱크 탱크들의 의견이 얼마나 영향력을 갖는가 하는 문제, 그리고 어떤 것이 정말 문제가 되는지도 신중하게 검토됐다. 제3부도 2개의 장으로 이뤄졌으며 이는 중국 외교 정책의 국가 정체성 또는 민족주의를 다루고 있다. 제1장에서는 2010년의 발전에서 보듯, 국가 정체성에 대한 담론의 변화가 정책 변화에 선행한다는 분석을 담고 있다. 제2장에서는 중국과 미국의 상호작용을 다루며, 중국의 민족주의가, 미국이 중국을 다루는 방식의 변화에 따라 고조됐다가 가라앉았다가 하는 현상을 지적하고 있다. 제4부는 경제 분야에 초점을 맞췄다. 금융과 통화 이슈를 다루면서 이런 요소가 어떻게 외교 정책 결정에 영향을 미치는가를 살피고 있다. 의사결정에 전반적인 초점을 맞추면서, 이 파트에 포함된 각 장들은 중국이 어떻게 정책을 조율하며 갈등을 예리하게 조정하느냐에 더욱 많은 관심을 기울이고 있다. 마지막으로 이 책의 제5부는 3개의 장으로 구성됐으며 중국의 대 한반도 외교 정책을 다루고 있다. 여기에서는 어떻게 중국의 대북, 대한국 정책이 만들어지는지를 논의하고 있다. 또한 남북한 관련 정책을 분리해서 보는 한편 중국 네티즌들의 여론도 살펴본다. 한국에 대한 부정적인 태도가 증가하는 등 새로운 현상들을 평가하면서 대 한반도 정책의 비판적인 변화를 철저히 파헤치고 있다.